Praline pecan butterscotch oatmeal cookie! It’s a mouthful to say, but ooey gooey and delicious! 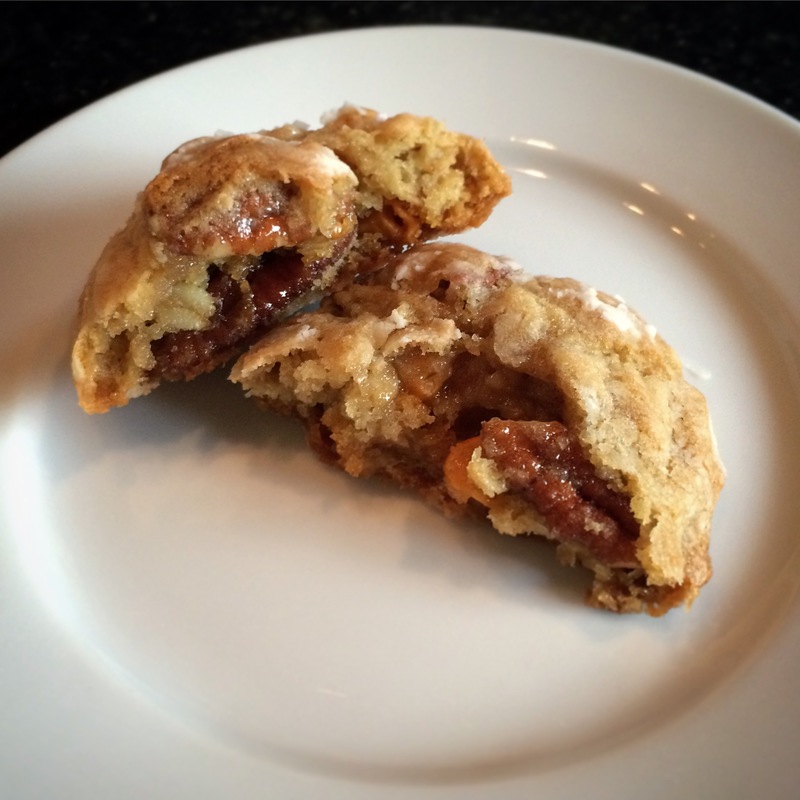 If a cookie and a pecan pie had a baby, I imagine this would be it! On a recent trip to New Orleans, we became addicted to Donald Link’s Cochon Butcher restaurant. We spent a week having lunch there everyday. How could we resist menu items such as Le Pig Mac? On the second day, I decided to try one of the their cookies. Oatmeal Pecan Butterscotch! OMG! One of the best cookies we’ve ever had! I was immediately in search of the recipe. Alas, Google did not turn up a Donald Link or Cochon Butcher Oatmeal Pecan Butterscotch cookie recipe. However, I came home to a the new Milk Bar Life cookbook which contained Christina Tosi’s Grandma’s oatmeal cookie recipe. I used that as a starting point for my version of the cookie I fell in love with. With a lot less granulated sugar, but keeping all the brown sugar for the caramelley flavor and other tweaks: Ta Dah! A wonderful ode to the Cochon Butcher cookie. Put confectioner’s sugar in a large bowl. This entry was posted in Cooking and tagged butterscotch, butterscotch cookie, christina Tosi, cochon butcher, cookierecipe, cookies, donald link, inspired recipe, milkbar, milkbar recipe, oatmeal cookie recipe, original recipe, pecan cookie, pecan pie, pecan praline on May 15, 2015 by friedchickenanonymous.